Units of the Libyan National Army (LNA) clashed yesterday with an armed group some 90 kilometres east of Sirte, near Harawa. Air force jets were brought in to attack the force and claim to have destroyed three vehicles and killed a number of fighters. According to one LNA source, the clashes involved fighters from the so-called Islamic State (IS). Locals are reported claiming that units arrived in vehicles flying black flags and set up a temporary checkpoint in the area. Both the LNA and the rival Bunyan Marsous operations room says that IS is increasingly active in the area again. Earlier this week, LNA spokesman Ahmed Mismari said there had been “a massive mobilisation” of IS forces in the area around Sirte. He claimed that they planned to move on the oil fields and terminals east of Sirte, and then towards Benghazi and Derna. Two days ago, a suicide bomber killed four members of the east’s security forces at the checkpoint at Nufliya, some 50 kilometres further east. 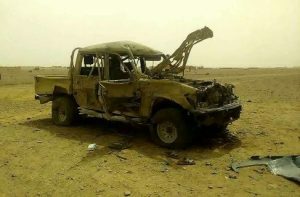 The IS also claimed responsibility for the Fugha checkpoint attack in Jufra district ten days ago in which nine LNA soldiers and two civilians were killed. According to another LNA report, however, the group involved in yesterday’s fighting belonged to the Benghazi Defence Brigades (BDB). Headed by Mustafa Sharksi, the BDB is widely reported to be operating further south in the Jufra district. It is known to want to move towards the oil terminals and then Benghazi. In fact, the LNA now regularly conflates the BDB and IS. However, although separate, there are suggestions that they collaborate and overlap.